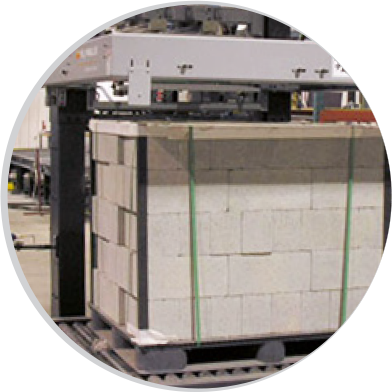 Pallet strapping, or banding, is used on loads that need strategic security and vertical compression but don’t require protection from dirt. Printed material is often strapped to a pallet, as are building materials like bricks or lumber. Steel banding is the oldest and strongest strapping material. Steel is best for heavy-duty holding where high strength and minimal stretch are important to load integrity. Plastic banding is a less-expensive material designed for light to medium duty unitizing, palletizing and bundling. Both materials are available in various widths, thicknesses and variations. With our software tools and systems-based approach to unit load design, Millwood can optimize your unit load design to meet your customer service requirements while minimizing your strapping requirements. We specialize in palletizing equipment of all kinds and will provide your operation with whatever you need to make your packaging system run smoothly.